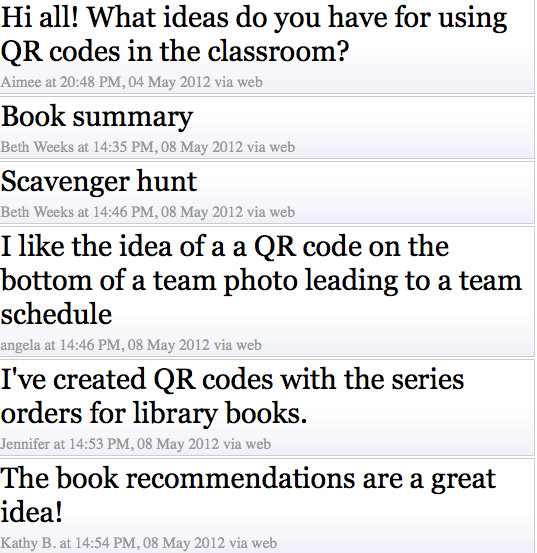 These are the resources from my session at the Region X Technology Conference on May 8.
i-nigma barcode scanner - https://play.google.com/store/apps/details?id=com.threegvision.products.inigma.Android&feature=search_result#?t=W251bGwsMSwxLDEsImNvbS50aHJlZWd2aXNpb24ucHJvZHVjdHMuaW5pZ21hLkFuZHJvaWQiXQ..
One of my favorite people on campus is Coach Parsons. She is so much fun! She's young and hip and just sarcastic enough to hang. She teaches Math and rocks at it. Her students love her. I've been looking for ways for Parsons to bring technology into her classroom. We used wallwisher (more about that in a couple of weeks) with some success. After my tech conference in February, I was thinking a lot about "the flipped classroom". And I knew Parsons' class would be a great place to field test my ideas. Educreations is a free iPad app that lets you create lessons. You can import pictures, draw with your finger and record your voice. 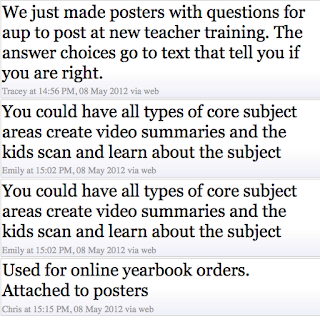 You can then share your lesson on Facebook, Twitter, via email or get a link to your lesson. 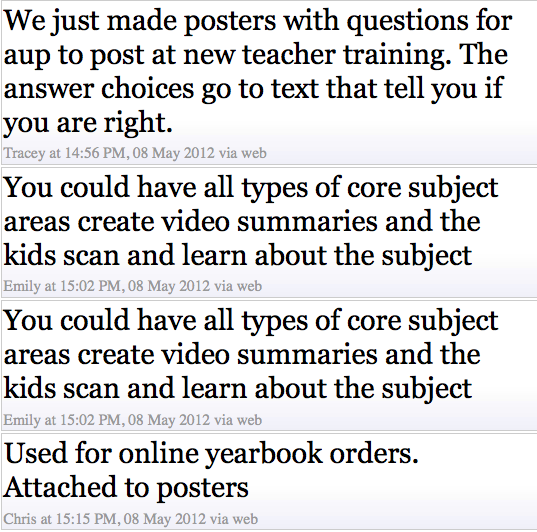 The idea was that Coach Parsons would record short, review lessons and post them to her teacher website. The students would watch the lesson at night or after school. Then they'd discuss the lessons in class. We don't yet have a 'school iPad' so I bring Parsons my personal iPad. She makes the lessons during her conference period. Nice and easy. We are both thrilled with the results. 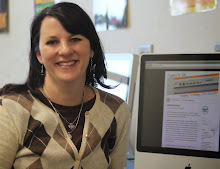 Coach Parsons reports that the lessons are easy to create and her students love them. I'm so excited to see her excited about technology. What do you think? 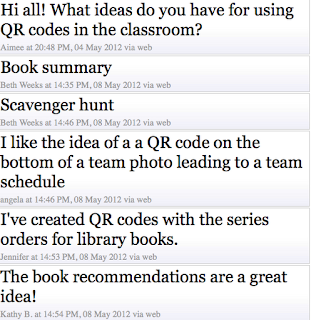 Have you used Educreations? What lessons have you created? Want to use Educreations? Need ideas? Let me know!